But if you could, you would. Why can’t you? You can’t “just do it” because putting things off may serve an important psychological purpose. 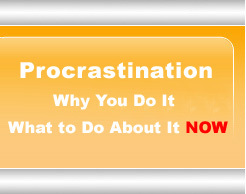 In other words, procrastination can also work for you, to protect a vulnerable sense of self-esteem. you can feel powerful, autonomous, or righteously angry, indirectly through avoidance. ADD. People with attention deficit disorder are likely to procrastinate because they’re easily distracted and need constant stimulation. Executive Dysfunction. People with ED are likely to procrastinate because it is difficult to organize, prioritize, concentrate, and follow through. Biological “clock genes” may lead you to relate to time in your own idiosyncratic way that has little to do with the clock or the calendar. Depression. If you are depressed, it may be hard for you to get yourself going on much of anything. Family history and current family relationships: Your procrastination says something about your role in your family. Social and romantic relationships: If you stopped procrastinating, how would your social and romantic relationships change? Your place in your current culture: Moving into a new culture economically or geographically can lead to procrastination. But these issues don’t have to doom you to a life of procrastination, because you can help your brain change: your brain has the potential for change throughout your entire lifespan! We think it’s essential to understand the reasons why you put things off and to know yourself, psychologically, biologically, and in relationships, past and present. That’s the first step in doing something about it — BUT all the understanding in the world won’t stop procrastination. If you scratch the surface of a procrastinator, you are likely to find a perfectionist. Procrastinators push themselves to produce something grand and impressive to meet high expectations and to make up for the time they’ve lost, hoping that being perfect will help them feel ok. But lofty goals are overwhelming and intimidating and can lead to more procrastination. WE SUGGEST PROCRASTINATORS IDENTIFY ONE REALISTIC GOAL AT A TIME AND BREAK THE GOAL DOWN INTO SPECIFIC, CONCRETE STEPS. Procrastinators either underestimate or overestimate how long things will take. WE RECOMMEND THAT YOU PRACTICE TELLING TIME, MEASURING YOUR PROGRESS IN 15-MINUTE INTERVALS, AND KEEPING TRACK OF TIME SPENT WORKING TOWARD YOUR GOAL. Most procrastinators don’t reward themselves until they have completely finished a task, so they suffer along the way and may never get to the end. WE ENCOURAGE YOU TO REWARD YOURSELF FOR PROGRESS MADE, NOT JUST FOR COMPLETION. SHORT-TERM INTERIM REWARDS CAN HELP YOU REACH YOUR GOAL. Some procrastinators hesitate to try new behavior or to think about why they’ve been procrastinating because they will blame themselves for what they’ve done. EXPERIMENT WITH A BEHAVIORAL GOAL WITHOUT SELF-CRITICISM OR BLAME AND LEARN FROM YOUR DIFFICULTIES AS WELL AS YOUR SUCCESSES.